My library doppelganger SHER C often reserves books I want to read, have read or need to read. Here’s a book that my doppelganger reserved that I need to read! Don’t worry. I left it on the shelf or him or her. I just reserved my own copy. When you order a book online from the Johnson County (Kansas) Library, you can pick it up on the shelf at the branch you choose. A shortened version of your name will be on the spine. My name is SHER C. There’s another SHER C, whose reserved book choices are often so similar to mine. I call him/her my library #doppelgänger. My library doppelgänger SHER C often reserves books I want to read, have read or need to read. Here’s one I need to read! The Japanese Art of Decluttering and Organizing” by Marie Kondo. In this case, the other SHER C is also my library angel. If anyone struggles with decluttering, it’s me! I’m practically a hoarder! The word doppelgänger is from the German Doppelgänger, a compound noun formed by combining the two nouns Doppel (double) and Gänger (walker or goer). The Library Angel is a phenomenon described by Arthur Koestler in which information (typically in libraries) becomes accessible through chance or coincidence rather than through the use of a cataloguing system. The Library Angel can be regarded as a form of synchronicity. Bernard Beitman, who conducted research in coincidence studies, found that 18% of his respondents had acquired information in an unexpected way. Arthur Koestler coined the term library angel for frequently experienced meaningful coincidences in which the right book or reference suddenly presents itself at a moment of need. Sometimes Facebook makes a joke in my timeline. I laughed when I saw these two posts together on my Facebook timeline. A coincidence? I saw this Facebook post on my phone screen: “This Food Poisoning Expert Revealed The 6 Things He Refuses to Eat.” Followed by the post “TO DIE FOR CARROT CAKE.” I checked, and thankfully the carrot cake is NOT one of the 6 items on the avoid list. However, the cake does look so rich that you might just die from bliss as well as sugar shock. “To Die For” Carrot Cake Recipe. 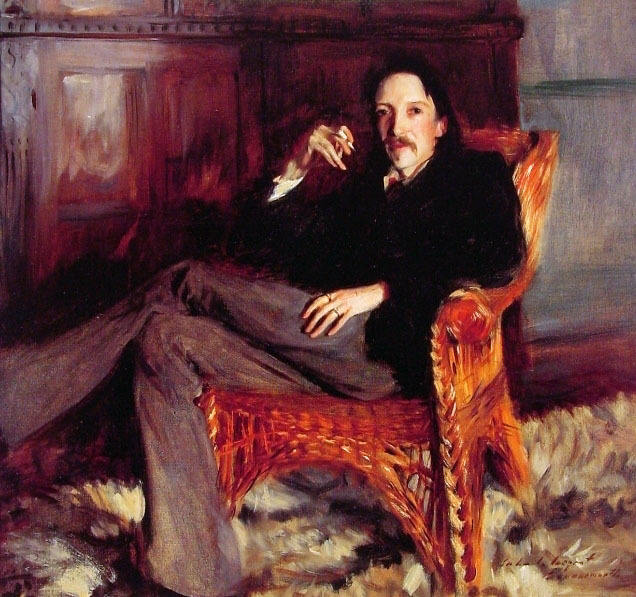 A portrait of Robert Louis Stevenson by John Singer Sargent. Yes, it’s that time of year again — Talk Like a Pirate Day is coming soon. Brush up on your sailor slang, pirate patois and buccaneer bravado. My first thought when I saw the 1950 movie “Treasure Island” wasn’t “Hey, me hearties, I love how those pirates talk.” I had a school girl crush on one of the actors — Bobby Driscoll, the boy who plays Jim Hawkins, and I swooned over his more upper crust accent. (By the way, I’m not that old. The 1950 movie was many years old when I saw it.) I became smitten with the fantasy of finding treasure, of treasure maps, of being a stole-away. On a recent drive home to Kansas City from a wedding in northeast Texas, we detoured to gawk at the Eiffel Tower replica in Paris, Texas. Ok, I’m the only one of the three of us to gawk…I have this thing for oddball roadside attractions. This Eiffel Tower isn’t the tallest replica in the world, but it’s the only one sporting a cowboy hat. Following a tradition of American cities named “Paris”, Paris, Texas constructed a 65-foot (20 m) replica of the Eiffel Tower in 1993. Paris, Tennessee, dedicated an Eiffel Tower replica in the same year that was 60 feet tall. (The Tennessee version was moved from Memphis and refurbished in its new Paris location in 1993.) The cowboy hat insures that the Paris, Texas, tower stands taller. Both replicas are dwarfed by the 540-foot-tall Eiffel Tower replica along the Strip in Las Vegas, Nevada, built in 1999. The original in Paris, France, is 984 feet tall. 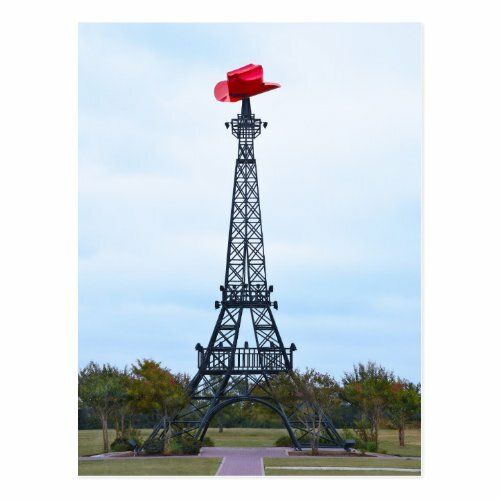 Paris, Texas, calls itself the “Second Largest Paris in the World.” The town boasts 25,171 residents, as of the 2010 census. Last year, we visited Paris, Arkansas, which doesn’t have an Eiffel Tower replica, but it does have a mural that depicts the Eiffel Tower, which you can read about and see in my blog post here: Every Paris Needs an Eiffel Tower The post also lists other states with Eiffel Tower replicas and other states with a town named Paris.